Security must be improved in the region where Lord's Resistance Army rebels abduct children and carry out attacks, he said while visiting Pader district. Mr Egeland urged the Ugandan government and international community to do more to end the humanitarian crisis. Almost two million people have been displaced during 20 years of civil war. 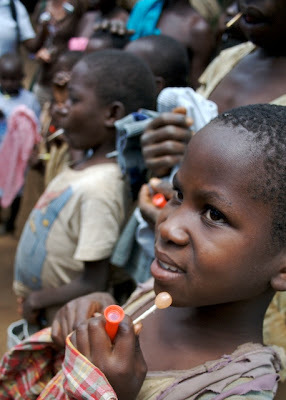 They live in camps, often in appalling conditions, in attempts to escape attacks by the LRA. In addition, many thousands abandon their homes in rural villages every night for the relative safety of big towns. In Pader district, the worst affected area of northern Uganda, Mr Egeland visited Patongo camp, a squalid home to about 40,000 people. The BBC's Will Ross in Uganda said Mr Egeland did not hold back when assessing the situation, and described the current humanitarian relief effort as plasters on the wound. "I don't think we really understand what it is when 90% of a population is terrorised into crammed camp conditions like this," Mr Egeland said. "I just met a women's group where all of the women had had their children abducted, Most of them had never heard back from them." Some of the camp's residents told Mr Egeland about the problems they face, which included inadequate healthcare and poor access to education. But the worst problem was insecurity. Mr Egeland said that although the rebels had become weaker, they remained strong enough to prevent people from returning to their villages. "Everybody has to do more," he said. "The government of Uganda has to do more, the army has to provide real security for the people, not only when they are inside cramped camps but when they go out of these camps. "We as aid organisations have to also improve conditions. Still too many are dying from lack of sanitation, lack of proper care." Former LRA child fighters needed to be reintegrated and the rebel leaders brought to justice, he added. As residents were telling Mr Egeland they did not feel it was safe enough to go home, the Ugandan military said it was clashing with pockets of rebels in the same district. Our correspondent says the problem is how to end the war. Negotiations with the senior commanders seem to be out of the question as they have been indicted by the International Criminal Court, he adds. Mr Egeland said ending the insecurity was his hope for 2006. But he said he did not think there was a purely military solution. He pointed to the insecurity caused by small groups of rebels and the fact the rebels were mainly abducted children. 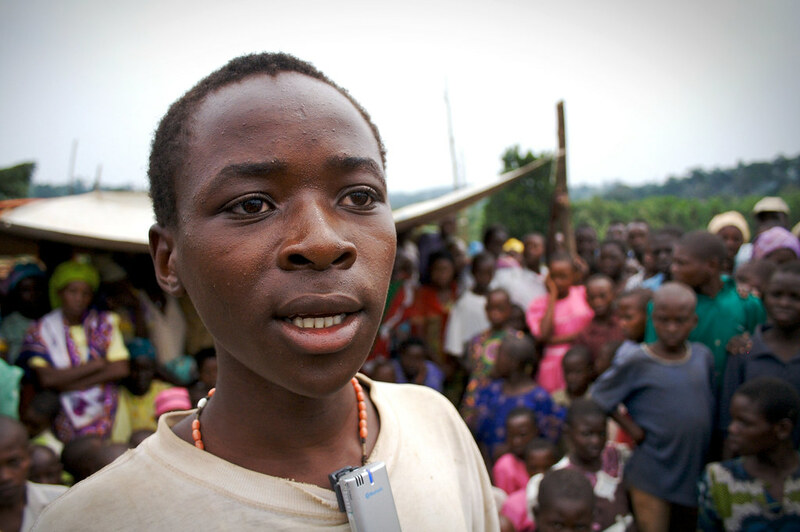 "We are not wanting all the LRA killed - these are children, abducted children of these women around us. "They should be able to demobilise and be reintegrated into society and I think it can happen," he told the BBC. After meeting Ugandan President Yoweri Museveni on Friday, Mr Egeland said it was positive news the government of Uganda was acknowledging the situation more than it had previously, and was promising action. On Sunday, the UN humanitarian affairs chief will visit southern Sudan, which is also blighted by Ugandan LRA attacks. Elton: JJ, you going to try some local snacks here? Kathy: You can't use that? 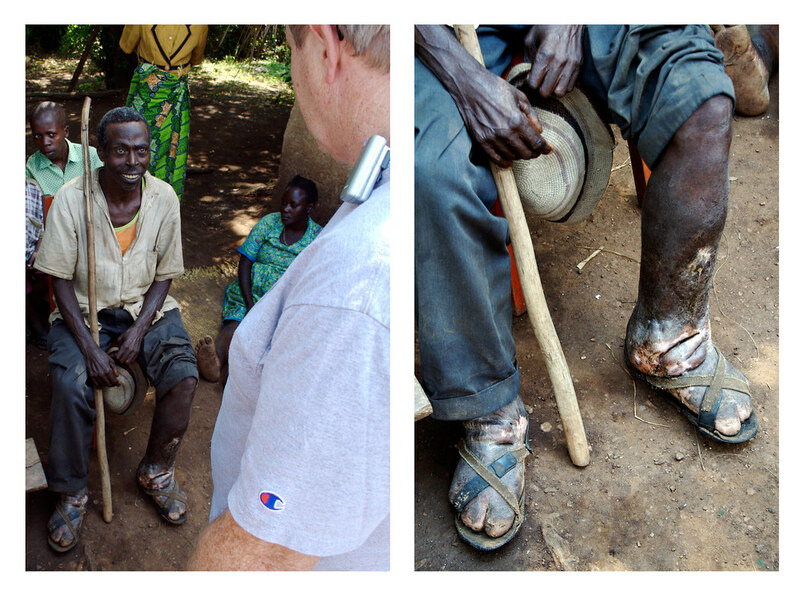 We saw some of the worse cases of elephantiasis as we moved further out into the village. It's stuff you only read or hear stories about. I remember watching the movie "Elephant Man" based on the life of Joseph Merrick in elementary school. So I had my own images in my mind. But seeing it in person and interacting with the people made it totally different. You begin to share in the pain... not just the physical pain, but the emotional pain, spiritual struggle, loneliness, etc. It's hard to look at this man's feet. It's unfortunate to say, but they were grotesque. There was a very disheartening smell to them from the bacteria that grew on his flesh and flies were buzzing all over his leg. It seemed like an open wound. 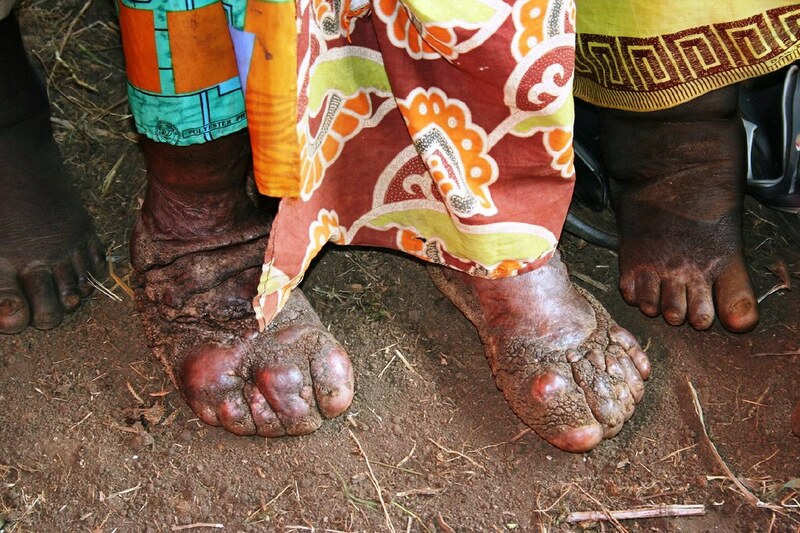 Elephantiasis is contracted from a parasitic worm commonly transmitted through feces. If your latrine isn't well contained and you don't wear shoes, it becomes a real threat. It takes a lot of exposure to contract it. But the threat of this seems remarkable since most of the kids do not wear shoes and all the latrines had open holes. The other unfortunate element is people with the disease are shunned by their community. It's tragic. This man's wife and kids have left him and he lives alone. We encountered many others later who also had the same affliction and we found it tragic that these people lived a lonely existence in such an impoverished environment. When they first met this man who had elephantiasis, Ben asked him, "When was the last time you were hugged?" And he said, "Not for 20 years." Ben then immediately gave him a long, loving hug. 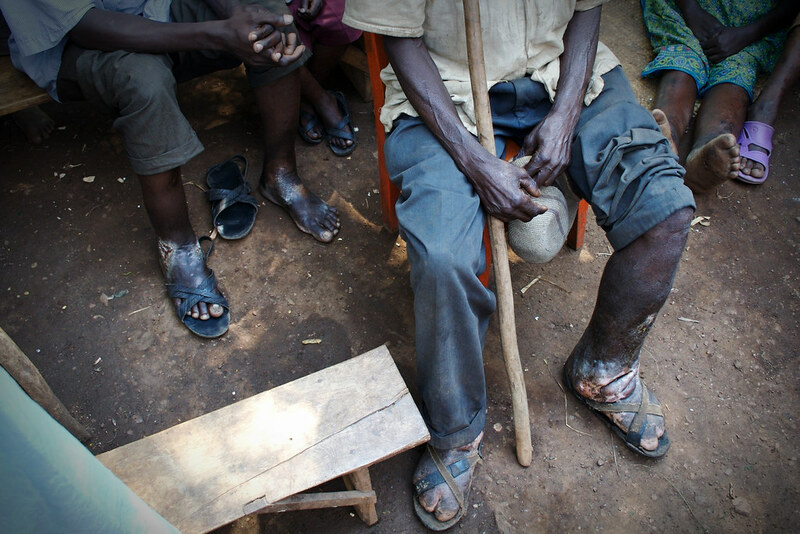 Another case of elephantiasis that we encountered in Kamwenge. The tragic thing is that treatment is very simple. But people aren't able to afford the medication. And on top of that, they aren't able to afford transport to the clinic to receive treatment. And when you're making $5 a month and it costs $20 for treatment and $15 for transport, getting medication seems almost impossible. So many have had the disease for many years. Every time we would see this, it would break our hearts. There were way more cases than we expected and so many people were so eager to get any form of treatment. They weren't in pain physically, but they lived with this obvious affliction - maybe analogous to the "scarlet letter" - everyone in the village knows who you are and no one really wants to associate with you. What do you do? What kind of existence do you live? There were a lot diseases we don't even entertain in the West. So many concerns that never cross our minds. Shoes? Open latrines? Malaria? Elephantiasis? Tuberculosis? It's a different existence all together. There's definitely this "thank God" feeling that crosses our mind - thankful that we live in the world we live. Thankful that we live and breath in such a controlled, safe environment. But I also think there's this realization that people in the world battle this everyday. And the more we interacted with people and saw their faces and heard their cries for help, we began to realize our shared humanity, our need to help our friends... our family. It didn't feel like the rich coming down to the poor. The elite down to the ordinary. But brother to brother, sister to sister... friends. And it still confronts us that our brothers and sisters are suffering, struggling on the other side of the world and the question still begs, "What's our response?" We're still working on it. But it demands a response. This orphan composed a poem that he wanted to share with our group. It was a very powerful moment and we felt his pain as he shared the following. The merciless cannibal who fed on our parents before we studied. What retribution can fit your wrong doings? What can we do to you to revenge the flesh of our parents you ate? And what are you to give out to replace the flesh of our parents you ate? The leader of harassment of widows and orphans. Where did you leave our fathers and mothers? When will you bring them back? Would all these reach us in the presence? The orphanage is not our case because we also didn’t want it. Reflections from one of our team members. Let's make one thing clear - JJ is not thinking about his wife. Photos always communicate so much - but there are stories behind the photos too. I think the pictures need to be connected with the real people who live the real lives. 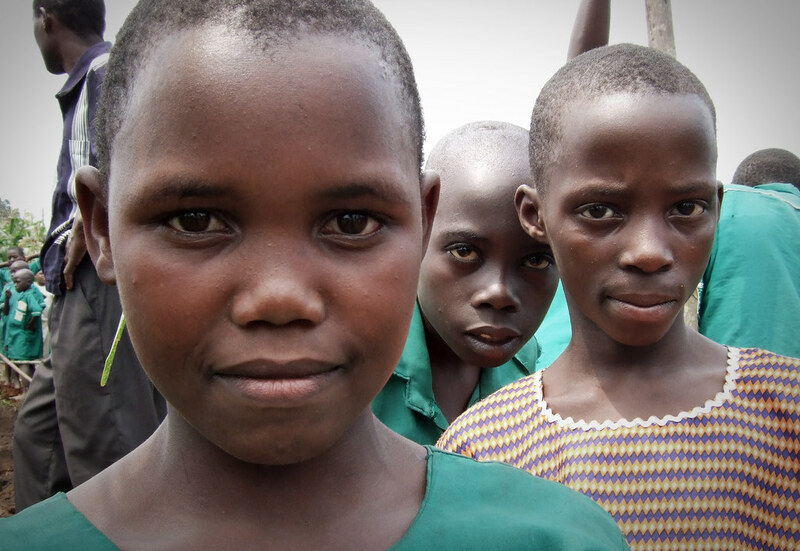 So here are a few stories from our time in Uganda. To just continue what Billy wrote on our first day... this is Cece - her story is tragic [as is most of the people we encountered]. Cece at one time was married with four kids living in the capital of Uganda. Her husband came home one day [and was said to have some mental issues] and killed her mother and beat Cece to the point where she was left blind. Uganda works on the "mob justice" system - meaning when there is crime or injustice, the men of the village take it upon themselves to provide retribution. They killed Cece's husband; no police follow-up. And though he arguably deserved it, Cece is now left without a husband, blind with four kids. To add insult to injury, she later fond out that she is HIV positive, no doubt from a promiscuous husband. Her story was printed in the local paper and tragically no one came to her aid. People in her village acknowledged her terrible fate, but she received no support from anyone. GFR has been working with local NGO's to locate the poorest of the poor and her story automatically came up. When Ben and Melody [founders of GFR] went to visit her, they knew that she would be a sponsor candidate, but they were so moved by her story that they decided that our team would begin the building of a new home. It's hard to live in Uganda... but to be a blind woman in a very handicapped-unfriendly environment is absolutely brutal. Most people don't have indoor plumbing so the new house would actually have an indoor toilet. Imagine needing to use the bathroom in the middle of the night. And then imagine that it's an outhouse 40 feet away away from your house, downhill, in uneven terrain, through goats and other brush/vegetation. 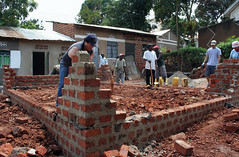 So we started building the house - something like 10' x 15' made of brick. It was a pretty triumphant moment because the entire community knew her story and as much I thought they would be jealous, they weren't. I find it a little remarkable that there isn't more theft [there is, but not as much as you'd think], or more jealousy, or more abuse. Don't get me wrong - it happens and people are people. But there's a greater sense of community than I imagined. The kids take care of each other. There is always a gang of them and they all know each other's names and they all look out for each other. When one of us gives something out, the kids take it back to their mom and the mom redistributes back to the other kids. It's quite poetic. Something that is hard to teach our kids back at home. And it seems to emerge naturally because frankly there is no other way. It's a matter of survival - you have each other and that's pretty much it. You can't cling onto anything else, attach your worth to it and let it become your identity. You've got absolutely nothing but each other... and that is something we have very little concept of in the west. During our time building the house we needed to get water for the construction and the way they get water is they get these 5-gallon jugs and walk over to the community water source [it's a running pipe from a local well]. 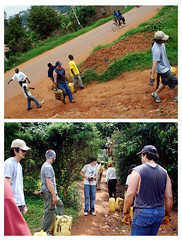 At our location at Cece's house, we walked about 1-km downhill to the well, filled up about 8 of the jugs and then walked back uphill... about a 15-20% grade. It was rough. I couldn't make it 30 yards without having to stop and make sure my lung was where it was supposed to be [and yes, I'm out of shape]. And most of the time I was only carrying one. The water, that's another story. Who the hell knows what's in that? All through the area are deep holes dug for their latrine. They put trash and whatever other crap [literrally and figuratively] they want to put in there. I can't imagine what grows in there... I don't want to. and there is one for each house; and fairly dense living throughout. There's got to be something growing in that water supply. One thing I noticed about Cece. She was [is] absoutely beautiful. I'm not checking out other women [I'm married and I love my wife] - but to be honest, it's hard not to notice how pretty she is. Now I don't think it's less tragic when you're not as pretty. But for some reason it just made it a bit more heart breaking to know that she was robbed of the beauty of her youth. Had the husband just killed the mom and not beaten her senseless, she might have had some suitors. But now that she's handicapped - no one, no one will come near her. She told Melody while they were sitting and watching the construction, "Don't leave me, I'm home all alone most of the day and I'm alone so often. Please don't leave me, I'm tired of being alone." It makes me sad to think that there are so many people who feel this same degree of loneliness - there has got to be some basic human needs. To not have to be alone... to know that someone in the world gives a damn that you're alive... that's got to be one of them. Before we started, Cece hugged everyone. She was so overwhelmed... it was only our first day in Kampala and we got a very full taste of Africa, the people and the plight. Day 1... it continues. 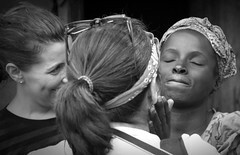 There is so much to process after a 12 days in Uganda. It's nothing less than overwhelming. I'm really at a loss as to how to make sense of it all - and having a hard time resuming back to normal. I'm pretty grateful for a clean, flood-like shower - the kind where you stand there and let the water run wild, opening your mouth and let the water go wherever it may. I'm excited to see my wife whom I missed dearly. 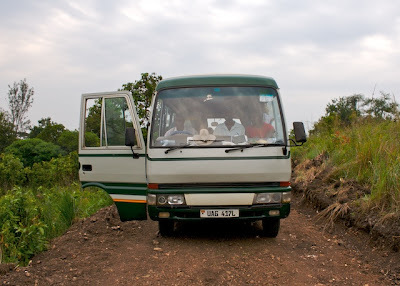 I notice the smooth ride of my car... the roads in Uganda are horrific at best. A trip like this always seems to put things in perspective. 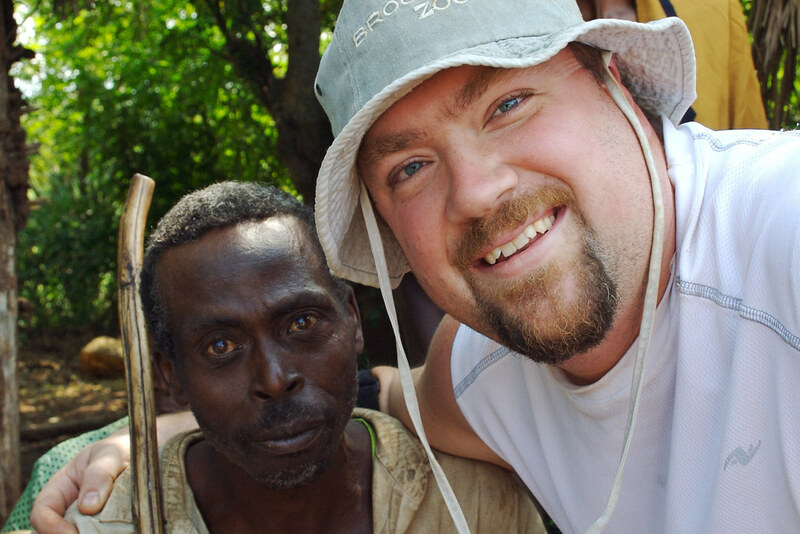 You know the feeling you get when you come back from a long trip - it's especially true for people who have gone on some kind of missions trip. You get this reverse culture shock thing. You feel foreign in your own land. You feel like you're out of sorts in many ways; like the world you used to live in doesn't make as much sense as it used to. The reason you feel it is because you've slowly become accustomed to living in the foreign land. You've developed some level of community and have learned to be a part of the culture/environment and in big or little ways, the place has become home. For a lot of people it doesn't take long... 2 weeks for some. But it's this point where you become comfortable [in a good way]; where it becomes a little like home. I didn't have that reverse culture shock. Because frankly, I never got comfortable. I never felt like a part of the environment; it never really felt like home. Every day we'd go out and I'd be flat out shocked with what I saw. Every single day. It might be with how people lived, how crazy the cars/motorcyles were, how many children there were... there were so many children. It might be from seeing so many diseases that just don't have any significance in the West. It might be the fact that people rarely lived passed 40 in the city. There was a doctor on our team who was in his early 50's and one of Ugandans we were working with remarked that he could only dream to live to his age. 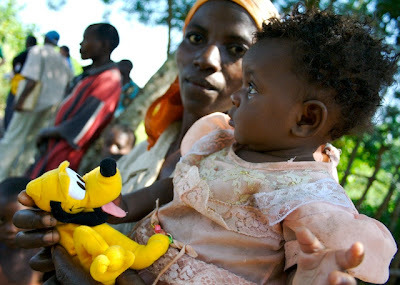 Kids without shoes or clean/intact clothes, people ravaged by disease, orphans and widows as far as the eye can see. It's just overwhelming - shocking in every way. Every day it was like this. I learned more about Uganda, the history, the social complexities, the politics, the daily struggle for survival by so many. But the last day was almost still as shocking as the first. I've seen pictures and have read about it in articles. I have books that talk about the situation in Africa, but to have seen it, smelled it, felt it... it's beyond comprehension right now. I'm asking now what it is that God wants us to see - what impression does he want us to take. I think it would be a grave injustice to just come back and pick up right where we left off. But I haven't quite got it figured out as to where we're supposed to be with all that we've seen. But I think it's OK to be a little confused right now. God will make sense of it all. Will write more later - I probably sound more desperate than I really am. But the fact is that there is so much to process and ponder. Thanks for your prayer support and care during our short time there. Since we really couldn't blog during our time there [weak internet], we'll blog some more from our notes and journal that we took while we were there. Everywhere we went there were kids. Tons of kids - everywhere. And so many of them were unattended to - no adult supervision. That would be unacceptable in the US. Many of these kids have had at least 1 parent die. And many are orphans. It breaks the heart to see so many kids starting out their lives this way. 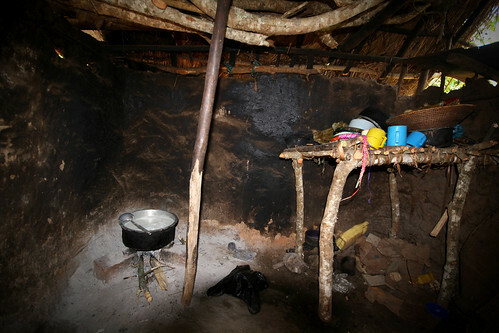 This is a common kitchen for Ugandans. It's a separate hut ouside the main sleeping area where there's usually 1 or 2 pots and simple cooking utensils. There's nothing electric or gas operated - just wood or charcoal [if they can afford it]. This was just for candy - we had tons of things to give out and this was the normal response. Cece's story is tragic in every way. Her husband came home and killed her mother [his mother-in-law] and beat her to the point of losing her eyesight. The husband was killed from mob retaliation [mob justice] within their village. She found out later that her husband infected her with HIV and she is left blind, widowed with four kids. Her and her kids are one of the families being sponsored through GFR and we began the process of building her a new home. Cece was so overjoyed she hugged everyone on our team. It is 5:23 am. I remember telling Elton.. "I'll be fine" and " I won't get up early!" So here I am.. up.. pretty early. hehe I also told Elton I would post when I woke up in the morning. Funny thing is that the thing that kept me up this morning was what to write. After about 21 hours of total flight time not including about a total layover of 15 hours we are back on American soil. 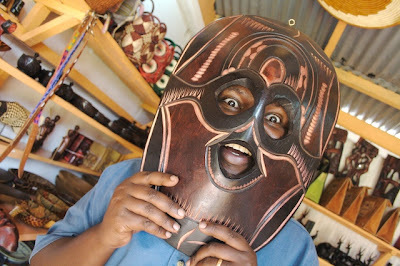 Glad to be home yet wanting to live among the Ugandans a few more days wouldn't have been bad. As a parting gift .. the official mosquitos of Uganda .. had a feast.. we were their feast!! So despite the bites that we got, the dirty water, rough 8 hour one way trips in a bus, no electricity for hours and in our case for days, and slow internet...I would have liked to stay a few more days. Last night as I arrived off the plane back in San Jose I couldn't help to think of what life changing thing that has occurred in me specifically. Has God spoke to me at all? What will happen to me now? Is this feeling of disconnection going to go away? Will others understand even a fraction of what I have experienced other than those who have gone the journey with me? I fell a sleep with these things on my mind and no wonder I woke up thinking about finding the right words to explain what this experience has done to me. Uganda -known as the "pearl of africa". Pearl is right. Despite the poverty that has swept this country and how AIDS/HIV have taken the lives of their families, the people that live there are why they are called that. I've have met so many individuals with the most amazing stories. Stories that have brought tears to my eyes. I've carried a child who has AIDS, her mother beaten to the point that she is blind and also suffered from the same disease. I've hugged individuals who have been looked down upon in their community because of their disabilities or their deformities. I have changed the clothes of a child who wore rags for I don't know how long who was terribly sick from the worms in her tummy from the dirty water that she drinks to stay alive which is making her sick. I have stood in a sea of orphaned children who when looking at me, in their eyes were telling me their own stories which I wanted to sit down and hear all of them. I met widows who were left by their spouses. I met families who took me to see where they have buried their child and most of the time children. All the heartache and struggle that these people have gone through and yet they smile. They smile and I wonder what for? What do they have to smile about? 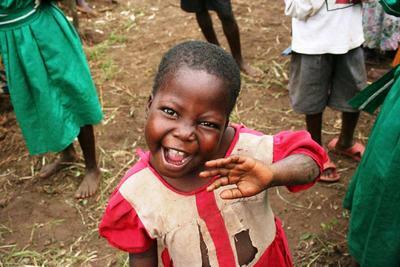 And I later came to see they smile because God has use us to bring them hope. They see God's hope for them in us. We went as far as being really close to the border of Congo. We road in a boat in the Nile River. We drove for hours to reach areas where I didn't think people even lived. I couldn't get out of my mind that only a few hours away northern Uganda still is in fear of the war they are still in. So close yet so far. 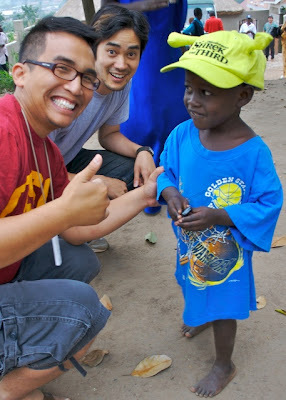 This is my 3rd missions trip and Africa is definitely different from Thailand. I have seen poverty and orphans as well in Thailand. But there is a difference between the both of them. It really opened my eyes more. It opened my eyes to see that there is so much more out there. God has reconfirmed my passion for the people in these poverty strickened areas of the world that causes me to step out of what is comfortable and to experience a lifestyle that keeps me thankful for the one I am living in. I have not felt guilty for what God has given me. I am positive that is not what God wants us to take from this. I think that the people smiled despite their conditions and tragedies in life because they are thankful that God has given them another day. That the reason why they look forward to another day is because of Christ. That is what God spoke to me. He didn't bring me to Africa to give pity to these people but to learn from them. To learn how to have faith in God. To learn to appreciate all that God gives. Simple things that we take for granted. I didn't come to help these people by all means, I just wanted to live among them and learn their story. If anything they helped me. They inspire me and challenge me. They have taught me to smile. I wanted to post up a ton of pictures but I was lead to my favorite picture of the whole trip. 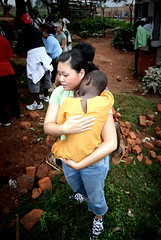 From what I got from the other orphans is that she is 5 years old. She did not look 5 years old she really looked about 3-4. I am not sure what happened to her parents but she was with 2 other siblings. 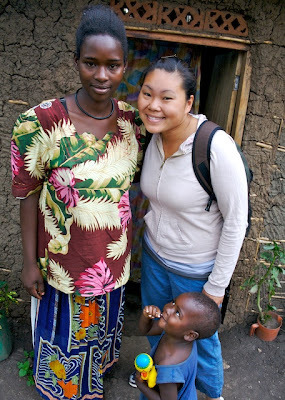 I met Sarah in a sea of orphans in Kemwenge. I was taking pictures of all these kids and what was going on. Then this little hand grabbed mine. I looked down and there was Sarah. That smiled she had on her face was priceless. She smiled like that everytime I looked at her. I fell in love with her. I kept catching myself looking for her and when I did find her, She would come to me and give me the biggest smile. 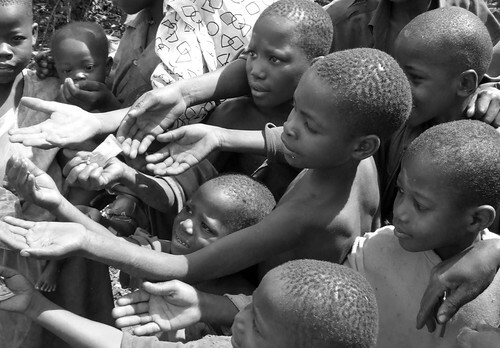 How we even got to where these orphans was a miracle because there was not a road to get there. We drove on a foot path and if it rained we were definitely in big trouble. This is the smile I am talking about. When it was time to leave. I ran back to look for Sarah and almost gave up but then she found me and I gave her the biggest hug. It has been a crazy trip but a blessed one. I am glad to have been exposed to this part of the world. God wanted me to be apart of it. God wanted me to see it. He wanted me to keep them in my heart. He wanted to bring them hope. How can one person make a difference anywhere.. we can only make a different when we obey what he has called us to do so that his work can be done. I saw that in Uganda. 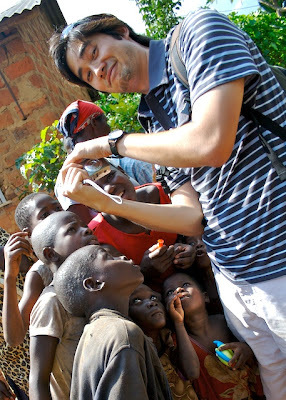 I saw how a small team as us brought hope to many communities in Uganda. It may take a while but God is big. Thank you Jesus for sending and using us. To bring hope. So its been quite a few days since any updates but so much has happened since that time and again i am at a loss for words really to desribe what has happened and what is going on. Like elton and I were saying... this ain't Japan haha. 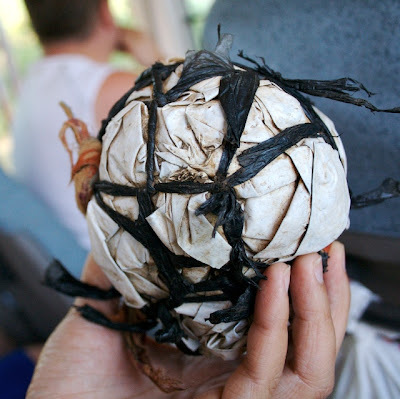 one thing though that has stood out to me over the past few days.... soccer balls. If you're reading this i'm sure you recieved an email from me about them. but i never thought that it have the reception that its been having. the beauty of it is that its something that a whole group of kids could enjoy too. so really. again. thank you. 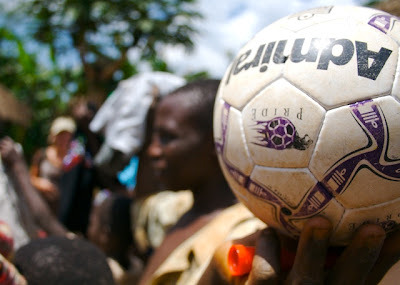 thank you for the soccer balls and the gifts you gave that mean so much to those who have so little. anyways. again I leave you with pictures from the past few days to complete the picture that i cannot. 1 girl in a family of 9, the father died and left 2 wives with 9 children. 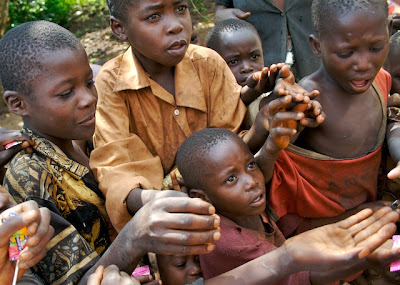 typical scene of children crowding around for candy. 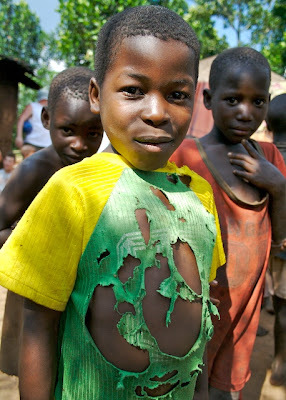 mokono is very poor, this is almost typical of the state of clothes they wear. this kid stood out because he ran after our bus for awhile as we drove by. Cyp, a buddy from a neighboring country hanging out w/ us. 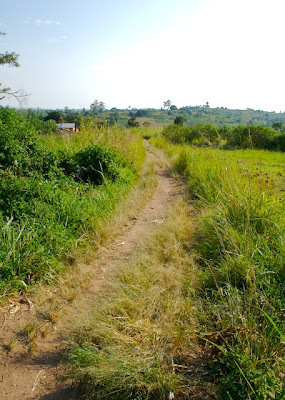 one of the many barely trodden roads we went down to look for families. 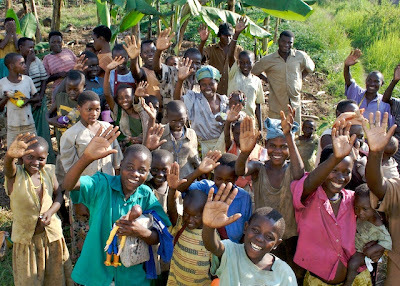 people of the village waving goodbye as we drive off. they seem happy eh? its nice to see that. this is our bus. this thing is a rock, it has taken us to the most unbelievable places. Moses is our driver... wierd huh haha. Lisa with Monica and her son. one of the families that GFR is sponsoring. Brian is a kid from the orphanage that we visited today. He wrote a poem for us and is reciting it here. it was pretty powerful, i'll post a transcript later. 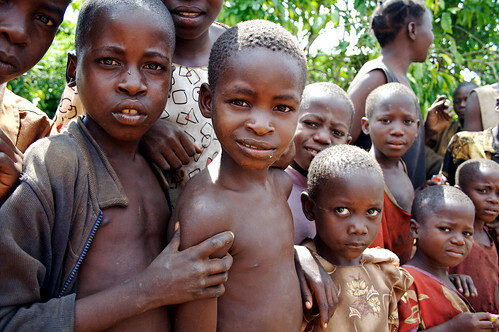 Note though all the kids behind him... they are all orphans whos parents mostly died from aids or other sicknesses.